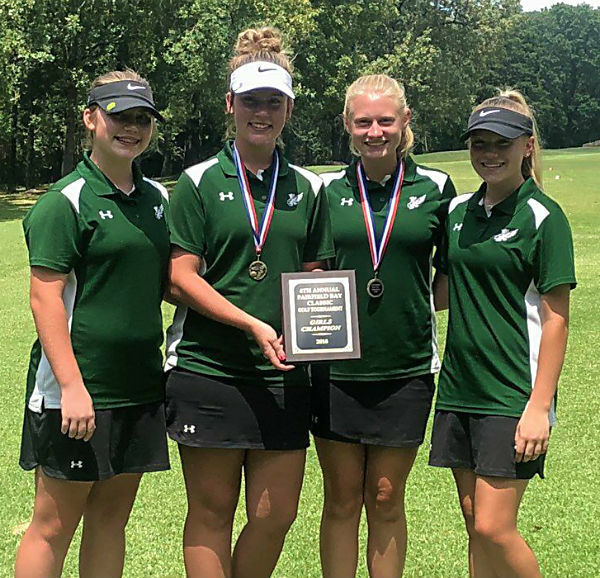 The Lady Eagles golf team won the Fairfield Bay Invitational Thursday a second consecutive year and the third time in four years. Kaylynn Finch earned medalist honors and Haley Gentry was medalist runner-up with the two best scores in the 9-hole match played at Mountain Ranch Golf Course. It’s been a successful week for the girls golf team. They competed against 1A to 4A schools in the Cougar Invitational and surpassed the second-place team by 60 strokes. The next match will be at Maumelle Links on Tuesday, August 14. the schedule is available on the WSHS Athletics webpage. Pictured: The girls team includes (from left) Kortnee Finch, Kaylynn Finch, Haley Gentry, and Kendra Harness. The team is coached by Shane Davis.